This info is about Universal Document Converter Server Edition for Windows. Below you can find details on how to remove it from your PC. The Windows release was developed by fCoder Group, Inc.. Additional info about fCoder Group, Inc. can be seen here. More information about Universal Document Converter Server Edition can be found at http://www.print-driver.com. Universal Document Converter Server Edition is normally set up in the C:\Program Files (x86)\Universal Document Converter folder, but this location may vary a lot depending on the user's choice when installing the application. You can uninstall Universal Document Converter Server Edition by clicking on the Start menu of Windows and pasting the command line C:\Program Files (x86)\Universal Document Converter\unins000.exe. Keep in mind that you might receive a notification for admin rights. Universal Document Converter Server Edition's main file takes around 3.45 MB (3612800 bytes) and is named UDC Tutorial.exe. 1. If you don't have Advanced Uninstaller PRO already installed on your Windows PC, install it. This is good because Advanced Uninstaller PRO is the best uninstaller and all around tool to maximize the performance of your Windows computer. 2. Run Advanced Uninstaller PRO. It's recommended to take your time to get familiar with the program's design and number of functions available. Advanced Uninstaller PRO is a very useful system optimizer. Safety rating (in the left lower corner). This explains the opinion other people have regarding Universal Document Converter Server Edition, ranging from "Highly recommended" to "Very dangerous". 7. Press the Uninstall button. A confirmation page will show up. accept the uninstall by clicking the Uninstall button. 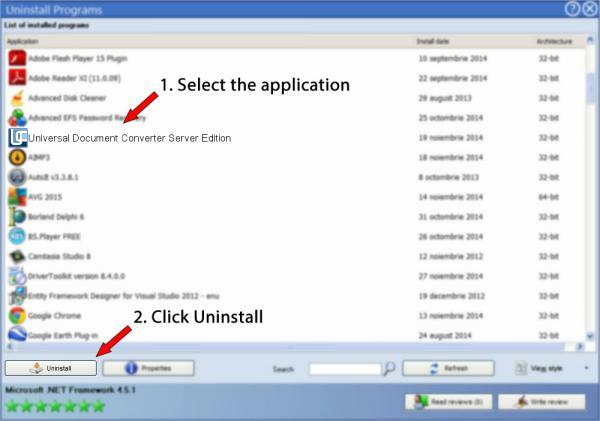 Advanced Uninstaller PRO will then uninstall Universal Document Converter Server Edition. 8. After uninstalling Universal Document Converter Server Edition, Advanced Uninstaller PRO will ask you to run a cleanup. Press Next to proceed with the cleanup. All the items that belong Universal Document Converter Server Edition that have been left behind will be found and you will be able to delete them. By removing Universal Document Converter Server Edition with Advanced Uninstaller PRO, you can be sure that no Windows registry items, files or directories are left behind on your computer. The text above is not a recommendation to uninstall Universal Document Converter Server Edition by fCoder Group, Inc. from your PC, we are not saying that Universal Document Converter Server Edition by fCoder Group, Inc. is not a good application for your computer. This text simply contains detailed info on how to uninstall Universal Document Converter Server Edition in case you want to. The information above contains registry and disk entries that other software left behind and Advanced Uninstaller PRO stumbled upon and classified as "leftovers" on other users' computers.